When you think of the Atlanta Braves, you probably think of pitching. The team’s history is filled with dominant pitchers. The old saying of “(Warren) Spahn and (Johnny) Sain and pray for rain” applies to the Boston Braves’ dominant top of the rotation in the late 1940s and early ’50s. Phil Niekro was a staple as the ace of the Braves rotation for more than two decades. Atlanta’s rotation in the ’90s is considered to be one of the greatest of all-time, featuring Greg Maddux, Tom Glavine, John Smoltz and Steve Avery. This year’s rotation is one of the best in baseball, currently fourth in the majors in ERA (3.22). The members who probably come to mind first– Tommy Hanson, Tim Hudson, Derek Lowe — have all been very good this season. But there is a different Braves pitcher who happens to own a better ERA than Jered Weaver, Justin Verlander, Roy Halladay and Cole Hamels. His WHIP is better than that of Cliff Lee, Matt Cain, Tim Lincecum and Felix Hernandez. He is walking less hitters per nine innings than Chris Carpenter, Mark Buehrle, C.C. Sabathia and Clayton Kershaw. No pitcher in baseball has more wins, yet why is Jair Jurrjens not talked about in the Braves’ rotation and as a potential National League Cy Young candidate? His numbers this season are more than stellar. 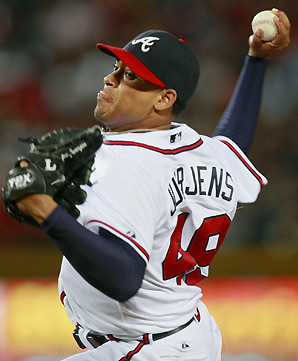 Jurrjens is 11-3 with a 1.89 ERA in 104.2 innings (15 starts). He is averaging 6.98 innings per start and owns a 1.061 WHIP, in part because he walks just two batters per nine innings. He has the best ERA+ (202) in baseball. Opponents are hitting just .229 against him on the year, with a .276 on-base percentage and a .313 slugging percentage. Over his past three starts, Jurrjens is 3-0 with a 0.89 ERA in 20.1 innings, including a one-hit, eight-strikeout, complete game shutout of the Baltimore Orioles last night. He has allowed just 12 hits while striking out 14 and walking seven. Opponents are hitting .171/.247/.229 against him during that span. What has been the difference this season for Jurrjens’ rise this year? Opponents have swung and missed at his pitches less this season (8.9 percent in 2010 to 7.3 percent in 2011) and his strikeout rate has also dropped (6.7 K/9 in 2010 to 5.4 K/9 in 2011). He has also gotten lucky, as opponents are posting a .257 batting average on balls in play, well below the league-average of .300. But at 25 years old, it appears he has matured and has learned how to become an efficient pitcher. He is using his fastball less, throwing it 63.9 percent of the time in 2010 compared to 58.4 percent of the time this season, and his changeup (20.2 percent in 2010 to 23.8 percent in 2011) and slider (15.9 percent in 2010 to 17.9 percent in 2011) more. The increase in the use of his off-speed pitches has helped him keep hitters off balance and keep things on the ground. Jurrjens is inducing groundballs 43.9 percent (compared to 39,9% in 2010) and flyballs in 34.2 percent (compared to 41.9 percent in 2010) of at-bats that do not end in a strikeout, walk or hit batsman. As a result, Jurrjens’ home run rate has dropped from 8.8 percent to 4.6 percent. Jair Jurrjens’ first-half performance is likely unsustainable due to the luck factor. However, his 2011 pitching success should not be altered too much during the second half of the season. By walking few hitters, and using his off-speed pitches to pitch to contact, he has become one of the best pitchers in the National League on one of the best staffs in baseball. 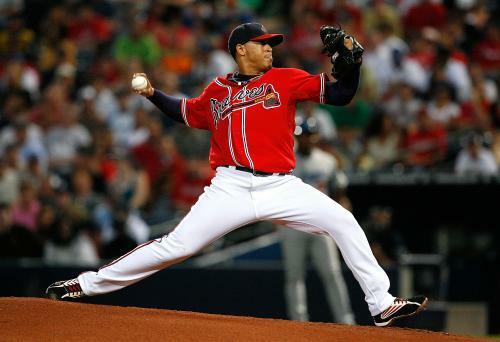 As long as he continues to show the look of a poised, mature pitcher and throw the ball well for the Braves, there is no doubt that Jair Jurrjens deserves to be included with Halladay, Lee, Hamels and Kershaw when it is time to discuss the NL Cy Young Award at the end of the season. This entry was posted on July 2, 2011 by Scott Kornberg. It was filed under Atlanta Braves, Jair Jurrjens and was tagged with Atlanta Braves, Braves, Jair Jurrjens, Jurrjens, Scott Kornberg.